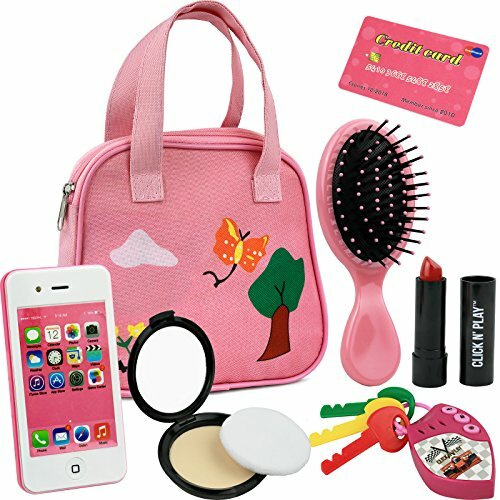 Little Girls pink purse loaded with everyday accessories, a great pretend play set for preschoolers, toddlers. Set includes; Decorative Pink Purse, Smartphone, car keys, credit card, hair brush, Lipstick, Blush with applicator. Pink purse features 2 carrying handles and a zipper for closing. All items and accessories are safe for little kids! Smartphone and car keys make real life sounds and lights. Car keys and smartphone operate on 2, 3 LR44 button batteries respectively. Pretend imaginative play sets helps develop child's imaginary cognitive skills. If you have any questions about this product by Click N' Play, contact us by completing and submitting the form below. If you are looking for a specif part number, please include it with your message.